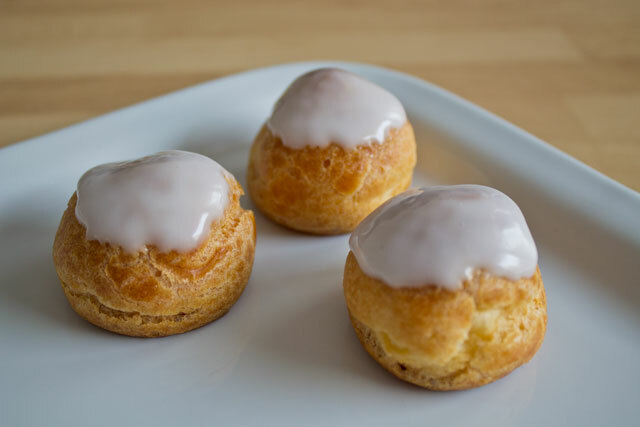 A fundamental, incredibly versatile dough in pastry is the éclair paste, also known as choux pastry or under the original French name of pâte à choux. You can find the basic recipe here. 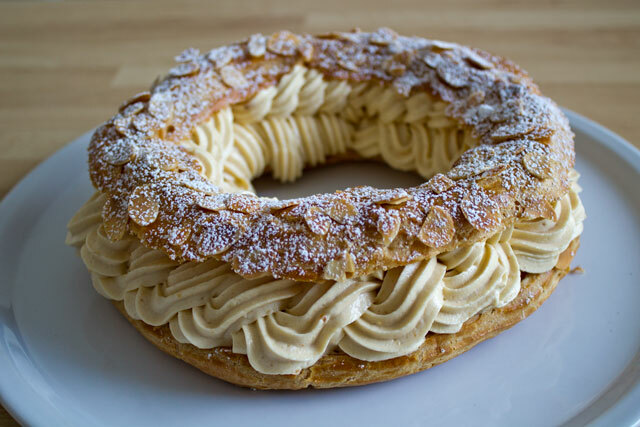 What can I make with éclair paste? 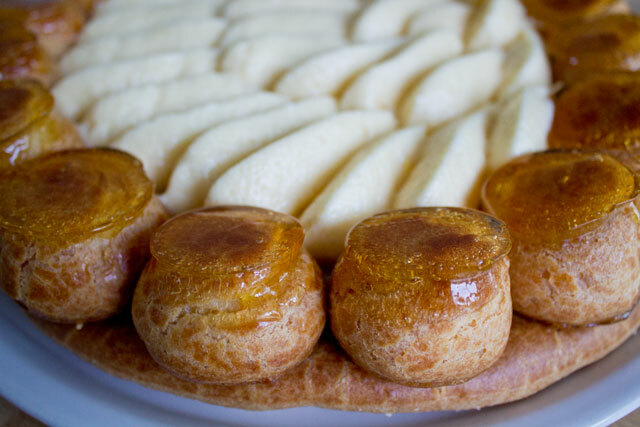 Pâte à choux can be used to make very different products, both sweet and savoury. Since the finished éclair paste products are usually “hollow“, they are filled with creams and ice creams. They are also traditionally glazed with fondant, mirror glazes or sprinkled with icing sugar. What is the procedure to make éclair paste? Bake or fry the batter. 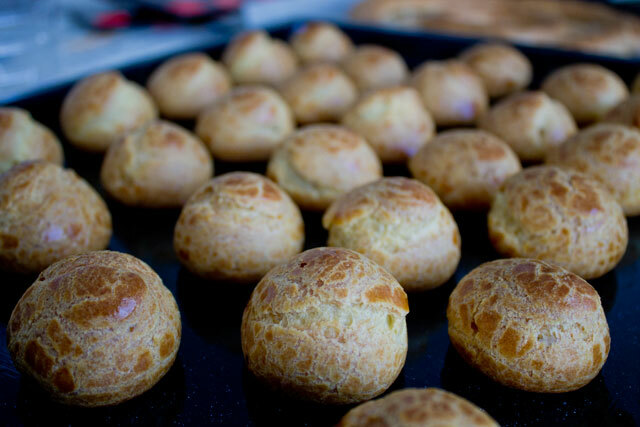 In case of baking, prefer relatively high temperatures (180°-200°) and slightly open the oven door only after the pâte à choux has risen enough (i.e. usually in the second half of the baking period). 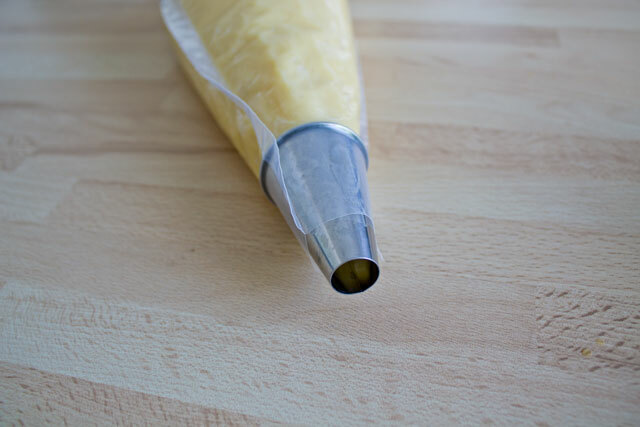 What is special about éclair paste? Why happens during the baking process? 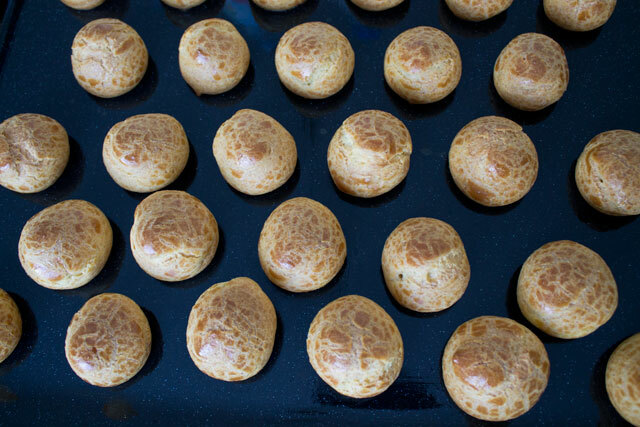 Pâte à choux is, dare I say, unique among doughs because it is cooked (in a saucepan) before baking in the oven (or frying). Adding the eggs in the dough one at a time: this helps forming the structure of the final product; the final batter must be smooth and shiny but not too runny. 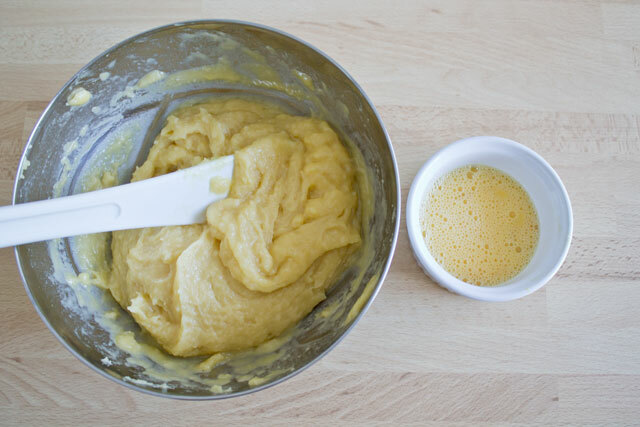 The eggs are added little by little to prevent the formation of lumps and also because it might not be necessary to add them all: our objective is to have a batter thick enough to be piped so, no matter what the recipe says, we should stop adding eggs when we achieve the right consistency, which depends on the strength of the flour among other factors. Steam: it is the major leavening agent in éclair paste. The liquids in the recipe are transformed into steam when they evaporate during the baking phase. Evaporation means that liquids apply an upward pressure on the dough: this causes the typical rising, which is stopped when the heat makes the dough set. In other words, after the initial upward rise, the air gets trapped under a thin layer, formed after the gelatinization of starches, with the help of gluten and coagulating egg whites. Finally, the baked product has to be dry, so it is advisable to let the steam escape completely by leaving the oven door slightly open after the first half of the baking period. This results in a hollow product with a relatively thin exterior. For this reason, it is very important to carefully follow the quantities and steps in a recipe of éclair paste. 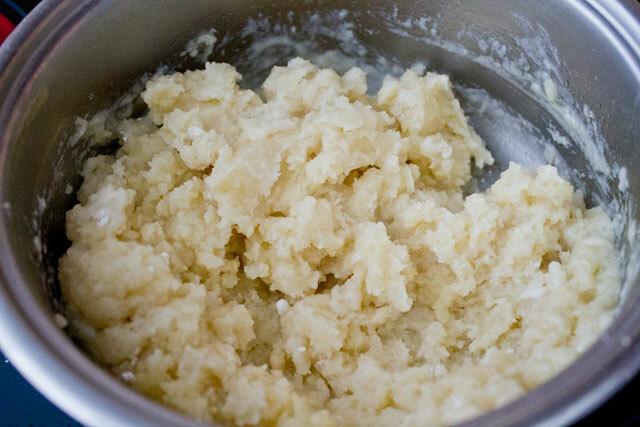 For example, recipes usually call for diced butter, because the latter must melt before the water boils: if water has to boil longer than needed, it will start evaporating, changing the proportions and compromising the recipe. The same reasoning applies to the eggs, which must be weighed to the gram (and then maybe the quantity can be adjusted roughly depending on the absorption rate and strength of the flour) and not added whole. Different proportions of liquids, flour and fats can definitely alter the final product, making it either soft, hard, wet, dry, with a thick or thin exterior, high-rising, or tragically collapsing after baking. Anyway, there is no standard formula for the best pâte à choux: different versions of éclair paste can be created for different uses. I came upon your website today when searching for a napoleon recipe and it felt like opening a special Christmas present! Your work is exceptional! I appreciate so much your talent and expression and am looking very forward to learning the world of pastry . I wish you a wonderful New Year and thank you in advance for all I will come to learn through referencing your beautiful website. Thank you for all the tutorials! I finally can find a blog that give all the details and steps and I really appreciate your passion on baking. For making éclairs, I always wonder why my éclairs surface will crack after baking? I have tried sprinkle some icing sugar before baking but it still didn’t come out with a nice surface. Have a nice day and bless you can achieve your goals soon! I think it is normal that eclairs crack irregularly during baking. Do yours crack excessively? Did you try this recipe? It might depend on the oven (normal heat, no fan) or maybe the quantity of eggs has to be adjusted. The best solution for a perfectly smooth top is to cover the éclairs (but it’s easier with puffs) with a thin layer of shortbread dough (i.e. 50g flour, 50g butter, 40g sugar). This will trap the air inside, letting the pastries rise evenly. Nice content but your scroll bars are tiny. Really hard to use.